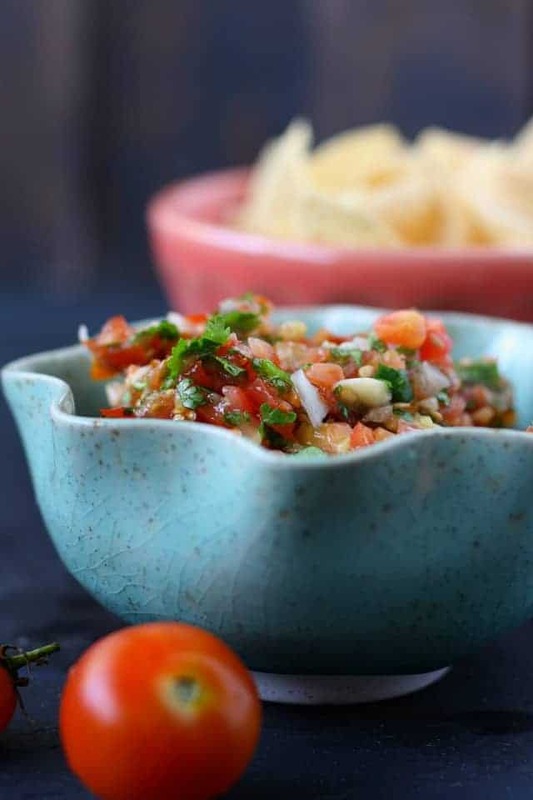 Home » Appetizers » Easy Cherry Tomato Salsa. When your garden is overflowing with tomatoes, it’s time to make cherry tomato salsa! 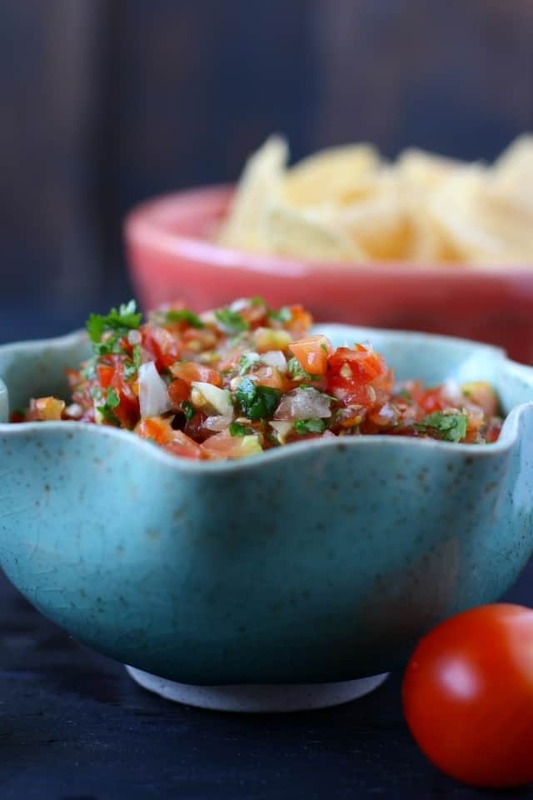 This simple salsa is so delicious and perfect for serving with chips or tacos. 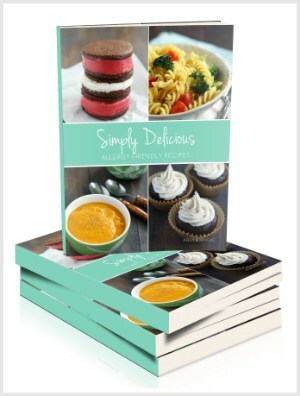 Even though summer is wrapping up here, I have a summery recipe to share today. Our garden is winding down, but we still had a ton of cherry tomatoes that we picked the other day. 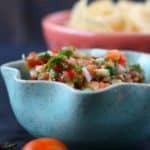 We’ve been enjoying salsa all through the summer, and since I knew I was going to make it one last time, I thought I would share this cherry tomato salsa with you. This is a fresh salsa, and it’s deliciously simple, and it’s allergy friendly, too! Cherry tomato salsa is so easy to make, and you can customize it according to your tastes. If you want to add more garlic, you can do that. Use a sweet onion, or a red onion, or you could even try green onions. If you want it to be spicy, add some jalapeno pepper. We don’t use any jalapeno, because we have kiddos that don’t like things too spicy. If you have yellow or orange cherry tomatoes, you can use those, too! You really can’t mess this salsa up – the ingredients are simple, and it makes a colorful, fresh salsa. Can you preserve this cherry tomato salsa? This is a fresh salsa, meaning there is no cooking or canning involved. You make this up, eat it, and refrigerate the leftovers. How long can I store this salsa in the refrigerator? This salsa can be stored for up to three days in the refrigerator. It’s really best when served right after you make it, though! Place the onion and garlic in the food processor and pulse until finely chopped. 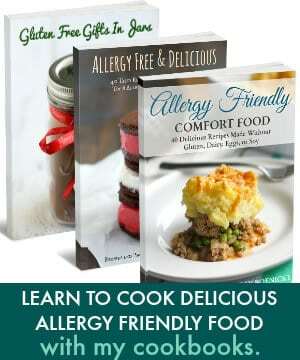 Place all the other ingredients in the food processor. Pulse until the salsa is the desired texture. 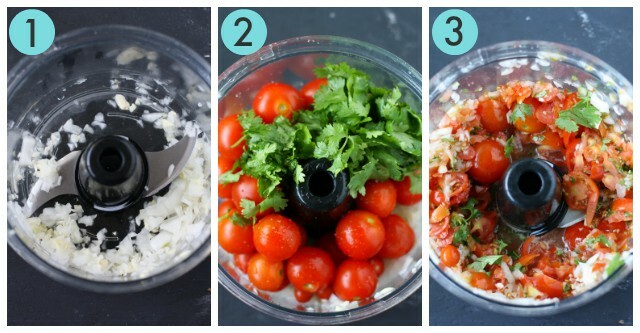 This cherry tomato salsa is so easy to make, and it's delicious! Enjoy it with chips, tacos, or quesadillas. Place the onion and garlic in a food processor, and pulse until finely chopped. 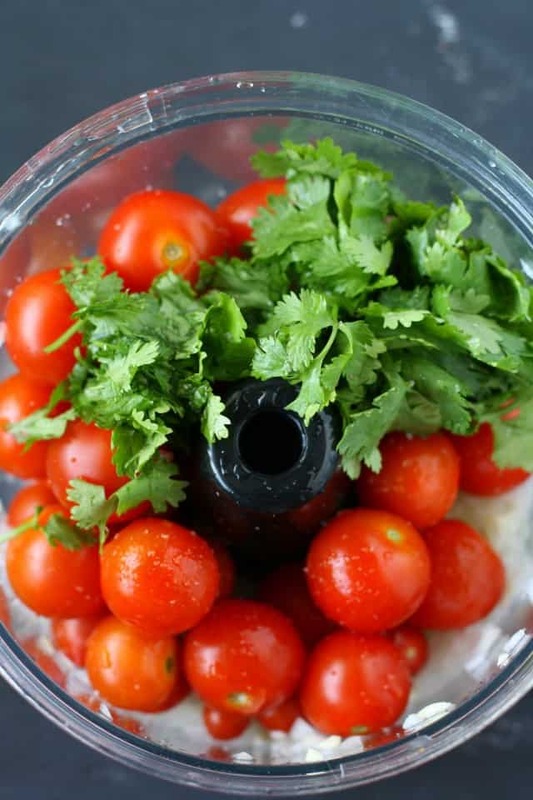 Add the cherry tomatoes and cilantro, and pulse until you reach the desired consistency. If there is a lot of excess liquid, drain some out. Add the lime juice and salt, and stir. If you want this salsa to be spicy, add some jalapeno when you add the tomatoes. 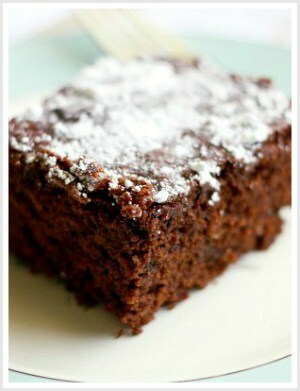 « 45 Gluten Free Pumpkin Desserts. It is so impressive to be able to say I made my own salsa!